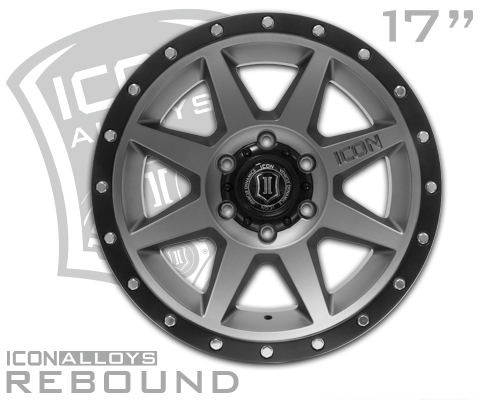 ICON Alloys is excited to announce the arrival of our latest wheel design, the ‘Rebound’. Combining sharp lines, a concave spoke design, and “ICON-optimized” dimensions, this new wheel is designed not only to improve the looks of your Jeep, truck, or SUV, but the overall function of the vehicle as well. Staying true to the ICON Alloys approach, the 17” Rebound has been engineered to maximize caliper clearance and optimize wheel position for un-hindered suspension travel and steering function. Backspace and wheel offset dimensions have been strategically developed to reduce scrub radius, improving all-around handling and ride quality. With build features such as these, and strength properties above the industry standard, a set of ICON Alloys Rebound wheels is the perfect complement to an ICON Vehicle Dynamics suspension system. PRECISION – Application-specific dimensions optimize vehicle dynamics and tire clearance for many of today’s most popular vehicles. PERFORMANCE – Engineered to reduce unsprung weight and rotating mass for increased vehicle performance both on and off-road. STRENGTH – Aluminum alloy construction provides high-strength properties that are well suited for heavy off-road abuse.